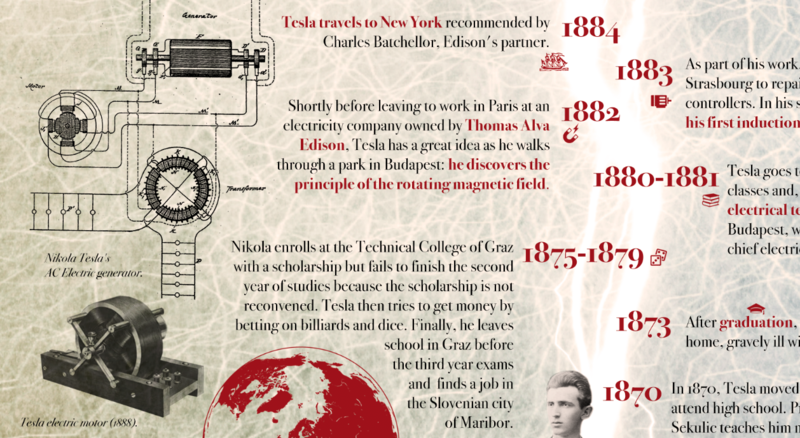 An infographic poster that reviews the life and inventions of Nikola Tesla (printed and digital)... with interactive audio! 48 backers pledged €765 to help bring this project to life. 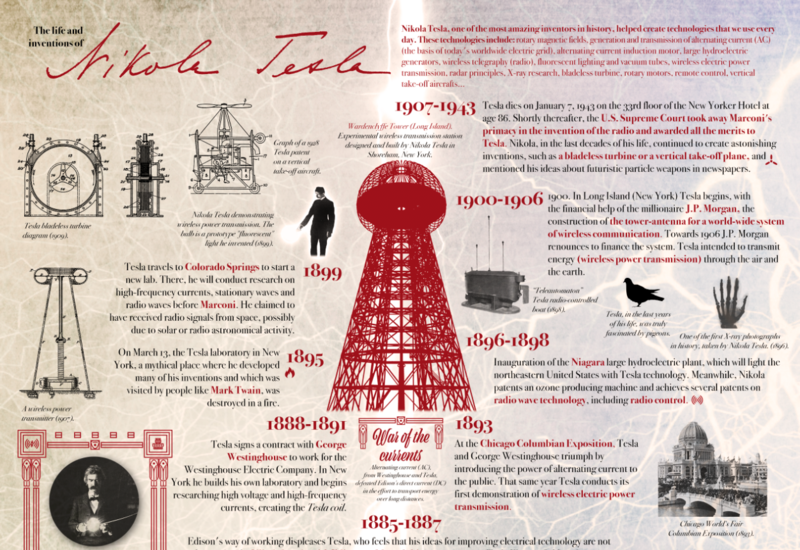 The final result is this poster that covers the main moments in the life of the brilliant Nikola Tesla, as well as his most outstanding and amazing inventions. But I didn't want it to be a simple poster, so I've added an interactive element: sound. Through a small QR code printed on the poster (it can be used with any current mobile phone or similar), you can access eight sound files (MP3, total audio duration of about half an hour) in which have been reproduced, as a recreation of the voice of Nikola Tesla along with environmental sounds, several passages of his 1919 work entitled "My Inventions". Here is an example of one of those audios. My goal was to create not only a visually appealing poster but also to add a special atmosphere to it through the audio files, trying to recover some of the passion Tesla showed when describing his inventions. I want to thank José Juan Saga for his invaluable help in creating that audio files. This project has received a rating of 9.4 by Profta. 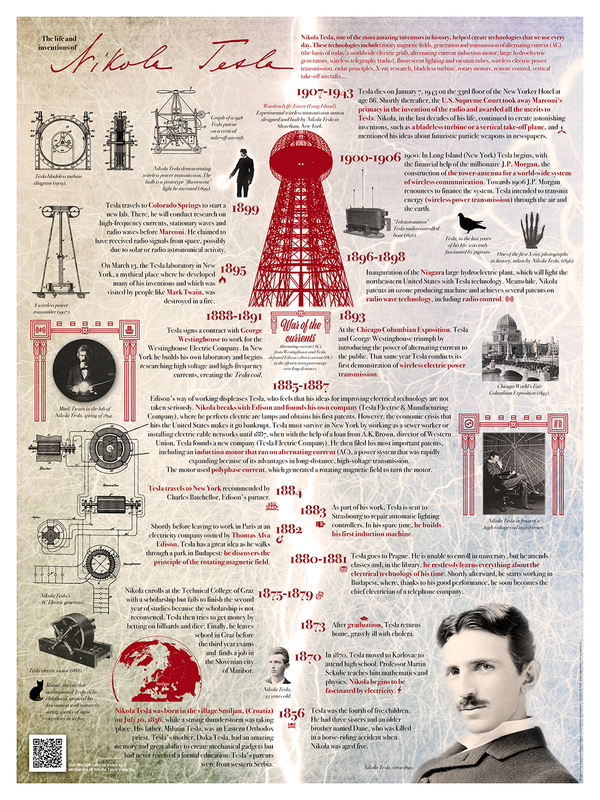 Nikola Tesla poster (digital download): High-quality PDF archive for printing, 18x24 inches (45x60cm) + 8 audio files in MP3 format. One Nikola Tesla poster (printed on high-quality matte paper and shipped rolled in a cardboard tube), 18x24 inches (45x60cm), with access to audio files via interactive QR code. Free shipping worldwide. One Nikola Tesla poster (printed on high-quality matte paper and shipped rolled in a cardboard tube), 18x24 inches (45x60cm), with access to audio files via interactive QR code. Free shipping worldwide. + Nikola Tesla poster (digital download): High-quality PDF archive for printing, 18x24 inches (45x60cm) + 8 audio files in MP3 format. Two Nikola Tesla posters (printed on high-quality matte paper and shipped rolled in a cardboard tube), 18x24 inches (45x60cm), with access to audio files via interactive QR code. Free shipping worldwide. + Nikola Tesla poster (digital download): High-quality PDF archive for printing, 18x24 inches (45x60cm) + 8 audio files in MP3 format. The original poster file (layered PSD for Photoshop)*, fully editable, so you can create custom versions + One Nikola Tesla poster (printed on high-quality matte paper and shipped rolled in a cardboard tube), 18x24 inches (45x60cm), with access to audio files via interactive QR code. Free shipping worldwide. + Nikola Tesla poster (digital download): High-quality PDF archive for printing, 18x24 inches (45x60cm) + 8 audio files in MP3 format. *The other PDF files of the rewards are ideal for printing, but they are not editable. The PSD file for Photoshop is the original I designed for this poster, with all its objects and layers. The poster design is completely finished and printing tests have been carried out to check the final quality of the paper. For the printed version this time I count on the help of a printing supplier that allows me to offer the poster both in printed version on high-quality paper as well as in downloadable digital version with minimal risk. The original poster file (layered PSD for Photoshop), fully editable, so you can create custom versions + One Nikola Tesla poster (printed on high-quality matte paper and shipped rolled in a cardboard tube), 18x24 inches (45x60cm), with access to audio files via interactive QR code. Free shipping worldwide. + Nikola Tesla poster (digital download): High-quality PDF archive for printing, 18x24 inches (45x60cm) + 8 audio files in MP3 format.